For other uses, see Convergence. Mesoscale sea breezes in Cuba converge from both coasts to form lines of cumulus. A convergence zone in meteorology is a region in the atmosphere where two prevailing flows meet and interact, usually resulting in distinctive weather conditions. This causes a mass accumulation that eventually leads to a vertical movement and to the formation of clouds and precipitation. Large-scale convergence, called synoptic-scale convergence, is associated with weather systems such as baroclinic troughs, low-pressure areas, and cyclones. Small-scale convergence will give phenomena from isolated cumulus clouds to large areas of thunderstorms. The inverse of a convergence is a divergence. An example of a convergence zone is the Intertropical Convergence Zone (ITCZ), a low pressure area which girdles the Earth at the Equator. 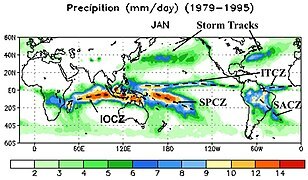 Another example is the South Pacific convergence zone that extends from the western Pacific Ocean toward French Polynesia. Convergence zones also occur at a smaller scale. Some examples are the Puget Sound Convergence Zone which occurs in the Puget Sound region in the U.S. state of Washington; Mohawk–Hudson convergence in the U.S. state of New York; the Elsinore Convergence Zone in the U.S. state of California; the Brown Willy effect which can be generated when south-westerly winds blow over Bodmin Moor in Cornwall; and the Pembrokeshire Dangler which can form when northerly winds blow down the Irish Sea. They can also be associated with sea breeze fronts. ^ a b LEUNG Wai-hung (June 2010). "Meteorology Basics: Convergence and Divergence". Hong Kong Observatory. Retrieved November 25, 2015.